A Frenectomy, also known as a frenulectomy, is a procedure we perform routinely in our office with a laser. This procedure involves the nearly painless removal of a muscle attachment called a frenum. A frenum, also known as a frenulum, is a tiny piece of muscle that typically attaches gum tissue to the inside of the lip or the tongue to the floor of the mouth. For a better description view the pictures below. In the past, frenectomies were done exclusively with a scalpel. We perform the procedure in our office with a diode laser. Want to see how we do a frenectomy in our Orange office? Watch this video showing all the details of the lip-tie procedure – including pre and post op photos – of a case on a 14 year old. In the post-op portion, our patient says “I kinda forgot about it” and “it wasn’t like painful or anything really.” We see that for all of our patients! Before and after photos on a 7 year old from West Haven. She was back to normal the next day. Dentistry and photos Dr. Nicholas Calcaterra. This frenum was interfering a bit with her speech. She was also afraid that it would tear so she wouldn’t move her upper lip normally. A 35 minute visit to our office was all it took – and the next day she was back to normal! We performed tongue tie correction on this young adult in the photos above. Although not as a common as a labial frenectomy, a lingual frenectomy is frequently done on teenagers and young adults who did not need the procedure when they were an infant. After the procedure, she was able to use speak more effectively, and her tongue no longer hurt when she yawned! For more information on tongue-tie frenectomies, see this article we did – with more photos! Before and after photos on a 10 year old pre-orthodontic patient. The frenum was increasing the gap between the two front teeth. Case and photos Dr. Nicholas Calcaterra. The patient above was 10 years old. She went to school the very next day. What else do we need to say? At the request of an orthodontist due to a concern about a gap between the two front teeth (called a diastema). In patients requiring partial or complete dentures where the frenum could interfere with the fit of the denture. To correct a speech problem. To correct a diagnosis of ankyloglossia (more commonly known as tongue tie or tongue tied). We perform this procedure after a recommendation from the appropriate specialist or when we feel it is necessary. Soft tissue laser used in frenectomy procedures. As mentioned above, a frenectomy was traditionally done with a scalpel. This technique, although effective, always resulted in significant post-operative pain with a longer healing time, frequent swelling, bleeding, and often the need for sutures. 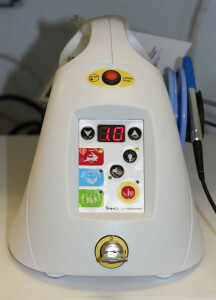 This changed with the introduction of the diode or soft tissue laser. Minimal use of local anesthetic. So less sensation of the needle! Rarely a need for sutures. Little to no post-operative discomfort. A return to normal speaking and eating activities typically within 24 hours. Frenectomies and other oral surgical procedures are routine activities for us in our office in Orange, CT. Call us at (203) 799-2929 or visit this page for a consultation if you are lip-tied or tongue-tied.